(L-R) CCCCC’s trainers, Diana Ruiz and Albert Gilharry, (standing) with government officers in a recent St Lucia training. 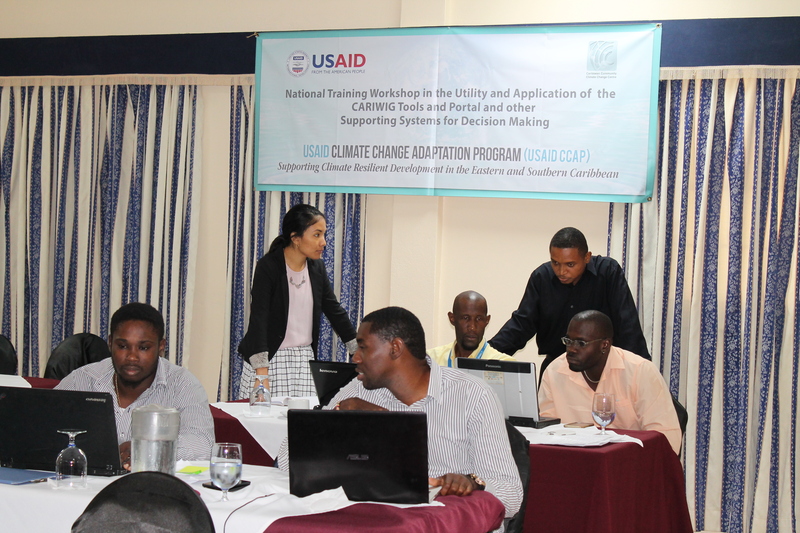 PRESS RELEASE – Belmopan, Belize; September 19, 2017 – A National Training Workshop on the use of Climate Impact Tools and Models for Decision Making is currently underway at the University of Guyana’s Computer Lab in Georgetown, Guyana. The workshop will run from September 20 to 27, and being held under the USAID-sponsored Climate Change Adaptation Program (USAID- CCAP). The Caribbean Community Climate Change Centre (CCCCC) is implementing the project that aims to build resilience in the development initiatives of 10 countries of the Eastern and Southern Caribbean, as they tackle climate change induced challenges. Under the project the Caribbean Assessment Regional DROught (CARiDRO) tool; the Weather Generator, the Tropical Storm Model and accompanying web portal and data sets have been developed and are introduced to countries of the Eastern Caribbean to help countries to enhance their development activities and reduce the risks to their natural assets and populations, due to climate change. The tools are open source online resources to provide locally relevant and unbiased climate change information that is specific to the Caribbean and relevant to the region’s development. The integration of the tools into national policy agendas across the region is being spearheaded through regional and country workshops, which are crucial to ensuring effective decision-making and improving climate knowledge and action. CCAP beneficiary countries are Antigua and Barbuda, Barbados, Dominica, Grenada, Guyana, St. Kitts and Nevis, St. Lucia, St. Vincent and the Grenadines, Suriname and Trinidad and Tobago.